In many ways the family in which I grew up would be considered by modern psychologists as “dysfunctional.” Most of the difficulties that we had stemmed from my father and the demons that he fought his whole life. Like every other father who has ever lived, Dad was a mixture of blessing and curse. The latter was easier to see for the first three decades of my life. By God’s grace, the former has become increasingly apparent over the last half of my journey. Ascol drove to Hembree’s home in a buggy. Accompanied by his 10 year old son (sic), Abdal (sic), who told Judge Graves at a preliminary hearing this afternoon that his father was shot down without warning. The boy said that Hembree was lying on a bed in the house when his father drove up and that before either he or his father said or did anything, Hembree fired through a window near the bed. The judge gave custody of the three children to a local farmer who abusively used them until my dad became of legal age and was able to separate himself, his brother and sister from the man’s authority. How Dad came to marry my mother is a fascinating story, much of which they took with them to their graves. Mom came from a strict Baptist family and her influence in our home is both inestimable and a testimony to the power of a faithful, godly, praying Christian mother. Their marriage was marked by the kinds of trials and sorrows that almost always result in divorce. It lasted 63 years until mom’s death in 1994 and stands as a testimony to the power of God’s grace in our broken world. Before he got married Dad walked an aisle and prayed a prayer in a Baptist church that took such actions as tantamount to saving expressions. Whether or not he was genuinely converted from that point only the Lord knows. He went on to become a Sunday School teacher and a deacon, the latter of which he remained for all of my years growing up. There were lots of times in my childhood and youth when I was ashamed of and embarrassed by the actions of my dad. His deficiencies were obvious and easy targets for sinful, youthful anger. It wasn’t until I came to understand more clearly the power and workings of the gospel that I began to evaluate those experiences in a more proper, accurate light. That light exposed both the sin in my own life as well as grace in Dad’s in ways that I could not previously see. Self-righteousness always distorts reality and only the grace of God in the gospel can deliver a Pharisee from it. That delivery, I am discovering, is a lifelong process. Dad died April 28, 1998. The last four years without mom were peculiarly trying on him. My oldest sister, Gay, took him into her home and, together with my youngest sister and oldest brother, cared for him through many physical difficulties. During those years I spoke to Dad every few weeks or so but only saw him on those rare occasions when I could travel from Florida to Texas. In most of those conversations he spoke words of remorse and regret. He knew he had left some deep wounds in his children and would often weep when talking about things he wished he could undo. 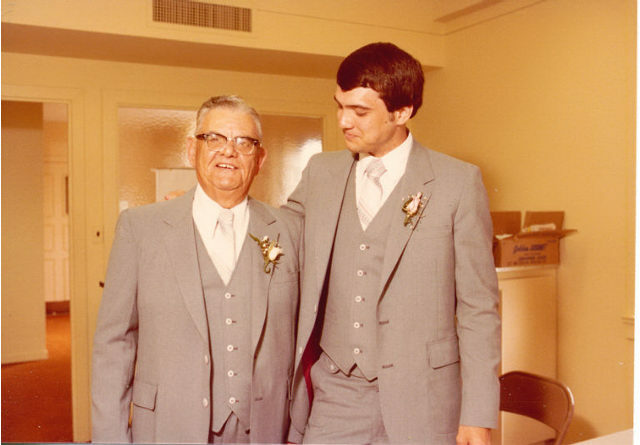 Just like the rest of his children, I tried always to respond by preaching the gospel to him; reminding him of things that he had heard and professed to believe, and helping him connect the dots between God’s grace and our lives. What I discovered over those last four years of his life is that the conversations we had were far more for my sake than for his. The gospel that I explained to my dad is precisely what I desperately needed—and need—to sustain me day by day. I often tell people who hear me preach that I preach to myself and they merely get to listen. That was true of my conversations with Dad, too. By having me explain how the gospel makes sense of our lives, grants hope in despair, and sanctifies sorrow with joy, God was causing me to explain the workings of His grace from His Word for my own benefit. God used my dad to teach me more about the depth of my own sin and the power of sovereign grace than any theological textbook I have ever read. I cannot begin to imagine the way sin ravages the mind and emotions of a small boy who is abandoned by his mother; or an 11 year old who watches his dad be murdered by his side; or an adolescent who feels responsible for his younger brother and sister but who is helpless to stop the abuse of their legal guardian. That my dad even stayed alive is a testimony to God’s grace. That this son of a Muslim married and helped raise (however imperfectly) six children, all of whom (including the one who is now in the presence of the Lord) love Christ causes the manifestation of that grace to be magnified. The last time that I saw my dad was on Christmas day, 1997. He had received a day pass from the hospital facility where he was being treated for one of his many ailments. Most of the family had gathered at my sister’s house and Dad enjoyed every minute of it. I drove him back to the hospital that night and helped get him settled back into his room. I kept finding excuses to delay my leaving because I was trying to formulate words that I had wanted to speak to him for the previous few years. I knew what I wanted to say, but I wasn’t sure exactly how. As he told me how much that day had meant to him and how grateful he was to be able to spend all of it with family, he began to veer again into the territory of his lingering sorrows and regrets for the pain he had inflicted on the family. I stopped him and reminded him that it was real sinners like us that Jesus came to save. I tried to explain that his life had not disrupted God’s purpose, it was an integral part of it. Grace shines brightest where sin is seen most clearly. Just as Dad had come to grips with his sin so he needed to come to grips with God’s grace and love for sinners in the life, death and resurrection of Jesus. Dad assured me that he believed that, and that he was trusting Christ as Lord but that he still wished he had been a better father. We wept. We prayed. We hugged. And I left with an overwhelming sense of God’s love for me and with deep gratitude for my earthly father. In certain ways he was an amazing man. More accurately, he was a man whose life reflects the grace and power of an amazing God. Despite challenges and failures that could have easily destroyed him, God sustained him, used him and brought him to a hopeful, if at times wavering, faith in the only Savior that real sinners have. I am grateful God made me his son.